Hundred of South Sudanese refugees arrive at Elegu Reception Centre in Amuru District in July 2017. Yumbe — Humanitarian aid agency United Nation High Commission for Refugees (UNHCR) and Office of the Prime Minister (OPM) are negotiating plans to resume receiving more South Sudanese refugees at Bidi Bidi refugee settlement camp in Yumbe District, Daily Monitor has learnt. OPM had earlier stopped receiving the refugees in December 2016 after the population at the centre was estimated to be 270,000. However biometric verification conducted jointly by OPM and UNHCR last year indicated that there were 224,000 South Sudanese refugees at Bidi Bidi settlement. Mr Juliao Acacio Jafar, the UNHCR head of sub office in Yumbe District, told Daily Monitor at the weekend that the current population of refugees at the settlement camp means they are able to offer space and services to more refugees. "After the Biometric verification, we came with a population of 224,000. This means the services established to carter for 260,000 refugees can still accommodate more," he said. Mr Jafar said they are currently in discussions with OPM to reconsider accommodating more refugees in the settlement camp. Bidi Bidi refugee settlement sits on a 240Sq Km piece of land. The Relief and Disaster Preparedness State Minister, Mr Musa Ecweru, told Daily Monitor in an interview recently that OPM is heading to Bidi Bidi refugee settlement camp for discussions before undertaking any further steps on receiving refugees. "The OPM, UNHCR teams are heading to Bidi Bidi refugee settlement on Wednesday (yesterday), we want to acquaint ourselves with the situation at the settlement. After touring the facilities and the area, we shall come out with our position," Mr Ecweru said. The Yumbe District chairperson, Mr Taban Yasin, said the district has no problem with OPM and UNHCR decisions to add more refugees arguing that the land given is big enough to host up to 300,000 refugees. "We have no problem with it. It's the discretion of UNHCR and OPM to add or stop receiving refugees, the land we gave them is enough to host more refugees," Mr Yasin said. 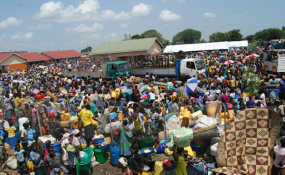 Last week, 50 South Sudanese refugees camped at Kitgum Police Station in Kitgum District after fleeing from renewed threats of violence from the neighbouring Imatong state in South Sudan. The refugees included 45 children and five adults. Uganda hosts some 1.4 million refugees with the highest numbers being South Sudanese.